The CD74HCT283 and ?HCT283 binary full adders add two 4-bit binary numbers and generate a carry-out bit if the sum exceeds 15. Because of the symmetry of the add function, this device CAN be used with either all active-high operands (positive logic) or with all active-low operands (negative logic). When using positive Logic the carry-in input must be tied low if there is no carry-in. This is one package pinout of CD74HCT283,If you need more pinouts please download CD74HCT283's pdf datasheet. 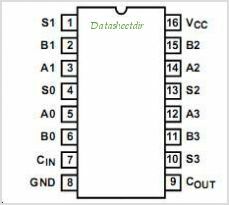 CD74HCT283 circuits will be updated soon..., now you can download the pdf datasheet to check the circuits!